A funny observation about D&D4. In order to create a unique number range for their game, which I suspect has to do with breaking D&D3's OGL number ranges, they increased starting hit points and damages to very high numbers. Starting goblins and other first level creatures have 20-40 hit points, which in previous editions only had 1-8 hit points. Weapon and power damages similarly went up to compensate (but not by the same magnitude). Now all is well and fine with those ranges, but it begs the question: why use polyhedral dice anymore? If your base hit points are so high, there is no real practical difference between a 1d6 weapon and a 1d8 one. With that many hit points, you might as well rate weapons on the number of d6's or d10's they do, and simplify everything to use d20's and one other dice type. It is a legacy of the original Chainmail game, where every weapon did 1d6, and the adoption of polyhedral dice, which allowed some weapon variation. Later games (AD&D, etc) tried to balance lighter weapons, such as the dagger (by making it faster), to mixed results. We've house-ruled the lowly 1d4 dagger ourselves as well many times to make it more appealing. But overall, the 1d4 dagger remains a potent weapon against monsters that have little more hit points than it can roll, and combined with a double-damage sneak attack, the weapon becomes quite deadly. Once hit points reach uber-high levels, the difference between weapon dice fades away, and the hefty ability score damage bonus comes into play (especially with D&D3's multiple attacks per round). It's like this in D&D4 as well, as you start looking for fixed damage adders from feats and other bonuses to raise your damage per round against these giant chunks of hit points. D&D4 had to bring the monsters down a little in toughness in Essentials, but the hit points still remained high enough to make the unique polyhedral dice wane compared to the character card powers. Keeping the original dice ranges is one thing the OGL and other old-school games do right, they preserve the power of the polyhedral dice, and keep the math down to manageable levels. In old-school D&D, it was common for a dragon to have 60 hit points, by D&D4 that grew to over 600. Beyond the chore of whittling that huge number down, choosing a 1d8 sword felt a lot better against the old-school dragon than the newer one. Think about blowing out your dice ranges when crafting your own game, and preserving the feel the dice give you with their unmodified rolls. George and I had a fun discussion this morning about the 'power level' of PCs in different games, especially as they level. Some games rocket the PCs into 'The Avengers' like superpowers, such as Exalted, many superhero games, and also MMOs like World of Warcraft. Many other games take things more slowly, and never really end up with more than stacked incremental buffs on multi-attacks (D&D3), where a +5 sword is as good as it gets. In WoW, characters typically start with 30-100 hit points, and end up with 100,000+ by the end of their career - with weapons and armor to match. D&D4 takes it differently, with power level (relative to challenges) capping out about level 10, and then a lower advancement curve on up to 30 (with monster power creeping ahead of the characters steadily). There are some serious play testing and balance problems with D&D4 post level 10, with stun combos and other tactics making blowing out monsters easier than it should be. Some of this was rectified in D&D Essentials, but really too little too late for many of the groups we played with. It's important for the players to feel powerful, but on the other hand, it is important for them to feel challenged. The system needs to supply the fantasy-fulfillment of that power curve, without totally blowing up and turning into a numbers game, aka Zynga's Mafia Wars (or yes, even WoW), where the numbers, attack values, and AP values don't mean anything after a while. If the game plays the same at level X as it did at level 1, with the same balance and feel, you have a game designed on a spreadsheet, with no real change in character power. The key is changing how the game is played every so often, and letting players get better at the new set of rules and challenges at these change-points. The game should change every so often, and players will have to get better at these new systems, adapt, equip, and excel. Games need to build in this play-style progression and change in order to keep interesting and make the high levels feel truly different than the low levels. Disney buys Hasbro and D&D? According to rumors, Disney may buy Hasbro, and by extension D&D. Check the link, and I stress, these are just rumors; but they are loud enough to be covered on several sources, Google it for yourself and dive into the speculation. Wow. If true, this would be the biggest shocker since Disney bought Star Wars, at least in our little corner of the hobby. Good or bad? I have no idea, it all depends on how open the company is with the fans and third parties. If good, it could lead to a new era of openness and roleplaying; if bad, it could be a failed resurrection saving throw. If true, I hope someone is put in charge that understands the 'RPGs as social' angle, and supports the community. Like Star Wars, there is incredible potential for coll stuff here, but also a real chance at a company locking up IP and doing it wrong. What could it mean for the game? It could mean D&D's demons and devils could be exorcised from the game again, aka 2nd Ed D&D. Sorry guys, you just don't fit in with 'brand management' anymore, and any chance of seeing Orcus Prince of Undeath walk around at a theme park has just been squashed. There are serious ramifications and corporate decisions like this that may fall out from such a deal, or in fact, anyone who buys the D&D brand. Another thought is that the IP in D&D has been pulled from so many sources, it's not really locking much up at all - Pathfinder has done much without much of the core D&D product identity. In fact, if the D&D IP were locked up, it may force real alternatives to emerge and blossom. If the game is opened up and established as the 'game of the community' this may not happen; if D&D is locked up it may force alternatives to appear. Even with locked up IP, good things may come of a Disney acquisition, it all depends on how it is handled. As a sidebar, this is another reason we banned copyrighted IP from SBRPG. In D&D, if your big-bad is a beholder, that creation is owned by the parent company of D&D, and thus subject to support and branding decisions from the home office. Of course, real roleplayers will say, 'so what it's my campaign anyways' and play with the beholder, and even port them to different systems. New players in the next generation would most likely start playing with Disney:D&D, and miss out on the old stuff that was removed from the game, for good or bad. With us and SBRPG, it's a principle thing, and we wanted you to create your own IP, create your own big-bads, and own everything in your game. Therefore, if some day you wanted to write a book about your game world, it would be a lot easier, since you started with everything that you created yourself. If we banned copyrighted IP, it got the creative juices flowing, and got you off to the right start. This was our choice, and in light of buy-outs and the pitfalls of playing with other people's IP, something I am proud we went with. TSR Returns? Or is that, TSR Returns! Check out this link for the new Gygax magazine, and kudos to James' Grognardia for pointing this out. This is being published by a notable crew of TSR and old Dragon alumni. It looks like there is going to be a new hobby magazine covering Pathfinder, OSR games, and a bunch of other RPGs. It sounds cool, and I am seriously checking it out. If there is one thing I would love to see is a new version of Gangbusters by the new TSR crew. I have heard in several places that the rights to the original Gangbusters game have reverted back to Rick Krebs from Wizards/old TSR. If those groups could get together, we would have one of the TSR classics back in print and action again. I can dream, can't I? It's helpful to study the 'formulas' behind games in order to understand them better. I was reading this very insightful post about monsters over on Jeff's Gameblog, and also reading the intro to the D&D4 Essentials DM Guide on 'what D&D is.' In essence, D&D is a traditional fantasy agglomeration, with a couple D&D 'staples' added to it to create the D&D 'feel'. Let's consider what these staples are, and try to break things down a little. It is probably easy to see most of D&D's 'staples' are mostly items not covered under the OGL (trademarked and product-identity), and a couple that are loosely, but strongly identified with D&D. The drow, beholders, carrion crawlers, color-wheel dragons, Lovecraft-borrowed mind-flayers, Grayhawk gods, Faerun, fireball/sleep/wish spells, vanician magic, and a bunch of other staples come to mind. Toss in D&D4, and you get world-specific creations such as the Shadowfell, Faewild, along with a bunch of other races, places, and things. This is similar to Microsoft's software strategy of 'embrace and extend' although applied to a fantasy-fiction setting. D&D likes to be the everygame, "Yeah, we've got that too." The next thing that usually happens is, "Oh, and have you seen this new D&D specific baddie? It sure is cool!" The same happens with Paizo's Pathfinder, it has all the traditional fantasy staples, then teases with world-specific bad guys, modules, organizations, or other content not under the OGL. With Microsoft software, they will take an open standard, and then enhance it to the point where the Microsoft solution is the de-facto standard. It is not a bad strategy, and it presents players with a lot of value-added content in terms of product support and player familiarity. Where it falls short is in longevity and openness. When the D&D4 books are resigned to the shelf of history, and D&D8 is out and the hot new thing, all that content is versioned away, unsupported, and locked into books that will most likely never be printed or used much again. The supported proprietary content that made the game 'cool' is no longer supported, old, and locked up behind a license that makes it unsupportable by third parties, even under fair-use in many cases. The OGL helps, and is a good thing for the most part (but falls woefully short in terms of electronic fair-use, etc). At least items under the OGL can be resurrected and used in new forms, bet then again, the OGL is a printed text-only license, and this limitation restricts games and other interactive entertainment. It is a good solution, but only goes halfway. We simply don't know how RPGs will evolve, how they will be played, and how creators will share content in the future; and supporting a license that restricts distribution holds the evolution of RPGs back in a way. The current OGL games are fun, cool, well-done, and craetive - but they don't advance the evolution of how RPGs are played, so they are holding back innovation. In SBRPG, we banned using copyrighted content for a reason - we wanted you to create your own IP, and license it any way you wanted. If you wanted everything to be free and open, so be it, hop on over to Creative Commons and grab a license for your stuff, and create away. The SBRPG game itself was closed-source, it's the best we could do at the time when we wrote it. The ideas you create with it are yours however, and you could share them in any way you wish. Car Wars: We started playing this game a long time ago when it was just a pocket box. All that existed in this world were poorly armored cars, with nothing larger than a van being able to navigate the roads of a distopic USA, a Mad Max like future of no gas, limited energy, and brutal gangs that ruled the roads. Couriers had to make due wit hshoving cargo in station wagons, and you had to keep some room and weight in your vehicle for salvaged tires, ammo, and the car parts you looted from your 'kills.' There was really no weapon more powerful than a high-tech laser, and even the one-shot heavy rocket was a deal breaker. Cool stuff, and it made you think. Along comes the expansions, and all of a sudden, 18-wheelers took the road, capable of carrying 20 tons of cargo, a house, and several of the cars in the garage all at ones. These behemoths had armor as thick as tanks, and could mount an arsenal of high-tech weaponry. Helicopters took to the air, and even giant cargo choppers could haul cargo to the far-flung fortress towns without navigating the hostile highways. Autoduel arenas made the sport of dueling popular, and what was once necessary road survival became commercialized and commonplace - even celebrated. The original idea was lost, and the game became less fun - for us, at least. there were plenty of hobby-shop groups running commercial duels for prizes and fame, and granted, that is an easier setup for a hobby shop to run and sell games with. For us, our original idea was survival in a hostile world, where fast cars ruled the roads, and motorcycle gangs stalked the dangerous zones. If a VIP needed to get to the next fortress town, they needed to hire a fast car - with an expert driver. No helicopter could fly them there, and they couldn't hop in a land behemoth armored bus to take them there either. Later on, blimps, boats, and even tanks took to the battlefield, the shark had been jumped, and the game just became a wreck. The focus of the original game was on the cars, and that's where we liked it. Later expansions almost entirely were devoted to autodueling sports, or new vehicle types. We can't complain, since George and I did one of the original submissions for aircraft rules back in the day, and still have the original rejection letter from Steve Jackson himself. But for us, there was a feeling that something was lost, that the game was moving away from what we liked about it, and we grew apart from the world and the game. The game was changed by the direction of the expansions, and the world was changed. It is an important thing to think about when you introduce an expansion to the game, and I can relate some of this with out current Arkham Horror play through (see an earlier post). More on the effect of expansions on that game in a later post, but for now, think about the above experience we had, and how your game design could better prepare players for what you may have in mind in the future. How would you handle an expansion to your game? How would you design it to not shock players with new material? Would you design your original world any differently? Think, prepare, and then expand - but try to keep what players love about your creation intact. This Doesn't Feel Like High Fantasy? I was playing World of Warcraft the other day, and I was struck by one thing - the game's world has a high magic level, with teleporters, moonwells, places of magic (good and bad), levitating buildings, and a ton of other super-magic standards in the world. This is truly a good example of 'high fantasy' and it conveys the uniqueness and magic of the world very well. Conversely, D&D3 and several of its game worlds are labeled high fantasy, but basically feel more like low fantasy. Note I said D&D3, the rules are forcing you to buy iron rations and 50-foot ropes, and putting most spells on a once/day casting time. The way magic is handled and the focus on survival pushes the world away from the super-fantastic, and gives you the impression of a 'boards and swords' world where magic is rare, magical races hide from humanity, and the world is another copy of Medieval Europe with Elves and Dwarves thrown in. Pathfinder has a unique split personality, where the rules are more simulationist like D&D3, and the art is way more fantastic and high-fantasy, with art depicting characters hanging in the clutches of Cthulhu-type monsters blasting them with magic spells. The game pushes the fantastic in the art, and then later on the rules catch up with unique classes and magic items. The later expansion books push a unique world a lot better than the basic guides, since the base books have to be compatible with other settings, they have to be more generic and D&D-baseline-centric. It is a split more like hard sci-fi and science fantasy, and the rules and presentation matter. One example that is interesting is Mongoose Traveller's large book and miniature book. The rules are exactly the same, but the large book has art with a traditional hard sci-fi edge, and the mini rules book has art with sexier science-fantasy style art. Same rules, different presentation. I feel Traveller does hard sci-fi well, but science fantasy not as well as other systems built for pulp two-fisted action. For fantasy, making sure the world-build matches the rules is critical to making everything seem like a unified creation. Design matters, and art plays a huge role here, because it sets the 'visual tone' for the game, and sets players' expectations for what they will read in the rules. One of the big parts of SBRPG was it's Action Agility system, which cut up a player's turn into a ever-decreasing action-point (AP) countdown. I have always liked AP systems, as they create a system where the player needs to make a choice of "what's next?" ad judging if an action is worth the cost. SBRPG put parries on the AP system, requiring you to save for parries, or pre-spend parry AP if you lost initiative. As a result, everything mattered, from your speed, to the weapons you carried, to the actions you performed. Everything was a careful build and calculation to return payout for energy spent. Over a turn, the resource was AP; in the long term, hits and the cost incurred by powers were also resources to be spent. Note the word resources here. Roleplaying games typically have strong resource management components, from survival games to dungeon games, the question becomes, "what do I give up to go a little farther?" and "what is the potential payout?" Some games reduce the resource tracking, such as D&D4, and shift it to managing your power list of encounter, daily, and at-will powers. Ironically, resource tracking in D&D4 became more onerous with all of the conditions in-play during combat, with a -2 to-hit condition for a monster linked to the applying character's turn, or being rolled off on a 50% chance per turn. D&D4 had a system of move actions, standard actions, and free actions - which basically meant you could move once, use a power or attack, and do any number of minor "free" actions as you would like. In reality, this is like most roleplaying games, where your actions are the "one and one" pair of move/attack, and a couple other things considered freebies. With an action point system, everything is tracked, from a punch, to reloading a clip, to aiming, and firing a pistol shot.Your actions during the turn change frequently, and the situation at-hand often dictates the action mix. For the next version of SBRPG, I would like to move away from the lowest-level of AP tracking, but still make deciding how you spend your turn's actions matter - especially from turn-to-turn. This is something the original SBRPG did not have, the concept of actions you don't take having an impact of future turns, or spending actions ahead of time to gain a future benefit. With a cross-turn AP and resource management system, the risk of taking an action or not taking it all of a sudden has to take the entire encounter into account. You will need to judge lulls in the action, and when it is safe to take actions to rest or restore powers, then burst into action again, spending your abilities wisely until the next rest point. Similarly, you will need to take your party's resources into account, if a party member is in trouble, you need to spend resources to assist them, and cover for party members taking a breather. This sort of action-oriented AP and resource system better reflects the movie-reality we shoot for in SBRPG, and also makes the game different from a traditional turn-by-turn RPG. Resources, risk-management, judging the encounter, and making a plan for how to survive and prevail are the goal of the action-system we are working on, and I think we have crafted a cool system that forces you to think across turns, and as a whole for the party's pool of powers, actions, and gear. Again, the design is tailored to the end experience, and does not repeat other designs just because they worked in the past, or are familiar to players. You need to break out when you design, and think to the experience you want players to have, and then plan out how this will work, and how you get there. As for another "what is a game?" question, let's tackle the "what defines player skill?" question. To me, player skill needs probability. Without probability, the game is like chess, or scissors-paper-rock. Your skill at these games is your ability to memorize patterns, and choose the correct move based on the board layout. The old arcade game Pac Man became this, where certain patterns were used on certain board numbers. This really isn't player skill, it is memorization. You can be skilled at memorization, but not skilled at playing. Let me explain. Take chess, and put a probability on capturing a piece. Let's say pawns capture at 50%, knights 75%, rooks 80%, and so on. Now what happens on a failed capture? You lose the attacking piece, and all of a sudden, what seemed like a certain thing is thrown into question. The player's skill is how well they can play odds, take risks, and react to unexpected losses. Skill becomes dealing with adversity, putting your pieces in a high probability situation of winning, and taking acceptable risks. Risks. With a 100% capture chance, there is a skill in memorization and analyzing the board, but it is more of a view and memorize action that does not require a direct risk analysis. The risk analysis is "will the other player miss this pattern?" which is a memory versus memory contest, rather than "am I putting my pieces in the position of the best probability of winning?" The latter implies you are thinking tactically on the immediate moves, and strategically across many moves. I admit, "player skill as probability reaction" is probably a controversial thing to say, especially to chess players. But we need to cut skill into these parts because it is too broadly defined in game theory. Skill at chess is reacting to situations with 100% certainty in their outcomes; skill at games with probabilities throws chaos, risk assessment, and reacting to unexpected situations into the mix. If everything says you should win this next fight, and you don't, how well do you recover? This is another measure of player skill that isn't taken into account with games where there is no random element. So if we wanted to be fair, we could say chess relies more on "memory/analysis skill," and games with random elements may have some of the "memory/analysis" skill, but they also have a hefty amount of "risk management" skill. It's important to divide these skills in order to design a game, because you will need to ask yourself which skill do I want players to use to overcome this challenge? Is this a "power X always defeats power Y" memory challenge? Or is this a "I have a 65% chance of this working, is risking the potential loss worth it?" type question. Know what type of player skill you are asking from your players before you design a game system or subsystem. One of my favorite answers to the question, "What is a game?" is "An activity you can either win or lose." The key definition here is the ability to lose. Under this definition, Farmville is not a game, nor are most PVE-MMOs. In those games, you may win or lose at individual actions, but there is a steady progression upwards, there is no losing - only if you quit. PVP-MMOs allow wins and losses, but in the general scheme of most of these, no ground is lost, and the same battlegrounds will be there for everyone tomorrow. In a large sense, PVP-MMOs are not games, they are activities. In a PVP game where wins and losses mattered, and the game's virtual battlefront was shaped by the individual results of thousands of battles, you would have a better case to say that is a game (i.e. Eve-Online). An activity is something like knitting, coloring, or doing a crossword - there is no chance of losing, and you are just passing the time.You may or may not get something after you are done, such as a pair of socks, or a high-level virtual farm; but there are always more levels to get, or a new pair of socks to knit. The value of the socks is probably higher than a virtual good, but nowadays, you never know what people will pay for the time other people spend. With the "games needs loss" theory applied to most pen-and-paper games, you can say most RPGs are truly games, with a couple notable exceptions. It all depends on the definition of "loss" in these games. In most, loss equals the death of your character, and thus the loss of the time invested in that character. Some RPGs discourage player death (the original Marvel Super Heroes), or even make it very hard to die in (D&D4), so these move more towards the "activity" than the "game" deifinition. Of course, a lot depends on how the referee runs things, even a super deadly RPG can be run "soft" and be considered an "activity" like a Farmville. If we define loss softer, and rule it a reset or setback, you could still fall within the game definition. You are still losing something, be it time, in-game resources, or some other variable. The lowest common denominator is that you lose time, and thus can't keep up well with others, or have to replay a section to get back to where you were. This is a valid loss, and fits the "game" definition. Now, the magnitude of this loss matters too, if it is just a one-minute setback, you could argue the loss is so small that the "game" definition is more like an "activity" and be correct in your analysis. Is this definition important? I feel it is, for something to be considered a game, you need to be able to lose. Otherwise, there is no risk or outcome - good or bad. The line needs to be drawn clearly, as many so-called game companies are merely pushing virtual activities, and the line starts to blur when these theories are applied to pen-and-paper games. Yes, you can consider pen-and-paper RPGs activities, but there is always that chance you lose your character, and the weeks or months put into that creation are lost - thus, you are playing a game. Wow, what a game. 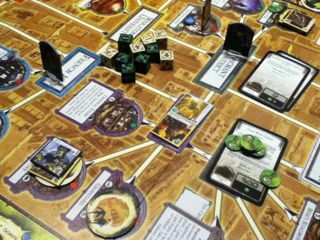 Arkham Horror is a game based on the Lovecraftian Horror mythos, and is sort of like a pen-and-paper RPG boardgame. Players take control of per-generated investigators, get equipment cards, adjust statistics, visit locations, and play through encounter cards while avoiding the horrors that lurk in the night. It is a seriously fun game, and I urge you to check out the reviews on the Amazon link above. Today we will do another Design Room discussion, which is not a traditional review, but more of a discussion behind game design theory using the game as a springboard for discussion. The game is best described as a traditional pen-and-paper RPG converted into a boardgame. No referee is required, and players take turns running the game's world events and monster movement. The city is divided up into locations where encounter cards can trigger monster spawns, skill checks, NPC encounters, and any number of random events. The events are self-contained and are typically handled within a player's encounter phase. Some players go to town with these cards, and roleplay out the interactions, with someone reading the card, and the player acting 'in character.' We tried that, and it was a hoot. Something tells me the design of D&D4 followed the 'make it a boardgame' design theory, but they didn't quite make it. Arkham Horror goes all the way, but it does lose a couple pieces of pen-and-paper baggage for simplicity. Gone is character creation, long item and spell lists, character advancement, and tactical combat. Combat is handled in the abstract, with a failed attack roll resulting in damage to the character. The question arises, can you call yourself a roleplaying game without these things? The roleplaying game Tunnels and Trolls has a similar abstract combat system, so not having a chess-like combat system does not disqualify the game from being considered a RPG. Items and spells are on cards, and I can think of couple RPGs like that (such as the new Gamma World); also, many RPGs did not have character creation (the old Indiana Jones game, or the basic Marvel Super Heroes may qualify here) - so those simplifications do not rule ut the game as an RPG. The only thing I can see as a RPG disqualification is the tight play structure, and a lack of being able to do anything you want, such as explore outside the town. Then again, some D&D4 modules I've seen share this tight focus, but with an implied 'roleplaying and exploration' mode built into the game (D&D4 Essentials laid this out explicitly). It is easy enough to house-rule exploration, travel, and roleplaying into the game with a referee - and that is an interesting point. The soft areas of a RPG require an interpreter (the referee). This helps us define the question 'what is a referee good for?' and also clarifies the boardgame-RPG difference. Backing away from the roleplaying elements, how does the game play? George and I came up with an analogy of it's like the MB game Axis and Allies, but you roleplay a general on the map. It's a weaker comparison because you don't have free standing armies (maybe the monsters qualify), but it is an apt description to setting up the board and playing a long game across a couple days. Not a lot of pen-and-paper games are capable of this, as a roleplaying situation needs to be handled live, and can quickly grow stale if left on the table overnight, With this game, you pick up where you left off, and the game-in-progress keeps fresh quite well. Another interesting play thought is that the game is entirely self-contained. Many RPGs try to be all-inclusive, and tell referees to pull in outside material to surprise players and customize the game. Everything in this game resides within the box: the world, the gear, the characters, and the challenges. Played straight, the original Marvel Super Heroes was a little like this, the Marvel Universe could be considered a self-contained entity within the game, and the pieces inside felt like a sandbox with all the parts in play: heroes and villains, equipment and locations. Could you pull in outside materials, like having Count Dracula show up in the middle of a game? Again, this would require an interpreter, and the requirement of needing a referee comes up again. D&D4 feels a little more self contained than other versions of the D&D game, and one frequent complaint was that referees felt like computers who's job it was to run the monsters and setup the encounters. Note this, if D&D4 was setup a little more like a boardgame, it could play very much like Arkham Horror. Right now, that is not the case, and the iconic 'dungeon master' must be present at all games. The old D&D Miniatures game did not need a DM, but it worked more like a skirmish game - without the adventure elements. The above statement will probably cause a lot of controversy, but it is a question that naturally comes up when you consider games like this - and MMOs. World of Warcraft does not need a dungeon master, and the ease-of-use of MMOs is a huge part of their popularity and accessibility. One of the more interesting parts of the pen-and-paper industry that some of the D&D3 designers brought up were that dungeon masters were the largest attractor of new players - if the game lost DMs, it lost popularity. Is such a heavy reliance on an interpreter and adventure creator actually a hindrance in playability? Let me put in a paragraph here stating I love referees and dungeon masters, I am one myself, and have been for decades. Nothing beats putting an adventure together and running it with players, a MMO's NPCs will always be flat and static quest givers, a dynamic story cannot be told without a referee, and we bring the game alive in many ways a deck of cards or quest scripting system for an MMO can't. You can never replace a DM with a rules system or computer (though D&D4 has come close, if you stick straight to the battles). Is there an answer? Probably not, but asking the question if Dungeon Masters are obsolete can focus the role of a DM down like a laser, and help us determine exactly 'what does a referee do?' If there are some systems better suited for the players only to handle, the game should design these to be run without a referee. Could you come up with a combat system that excluded the requirement for a referee, by giving monster's goals and scripts for the players to run? It is possible, and would free up the referee's time to do other things better suited for a live interpreter. Let me close this design room session out by saying that one of the best things Arkham Horror does is concentrate on the fun. The game has multiple personalities, more than on big boss, random elements, and a sandbox to play in - a lot can happen, and what happens is often unpredictable. Un-fun elements in previous editions of the game were worked out and eliminated, leaving a very concentrated play experience. This is game design done right, you publish a new edition of the game to concentrate on what is fun, eliminate the drudgery, and even cut out cruft and junk that makes the game complicated, heavy, and slow. Steve Jobs has a line where he said he was more proud of what Apple said "no" to, and game designers should work in the same mindset. Too many pen-and-paper games go too far, include everything and the kitchen sink, over explain (SBRPG is guilty of this), and just try too hard to cover everything. Games are complicated enough without all this extra explanation and fluff. It is tough, and finding a game that leaves marketing agendas, edition wars, and designer bias behind is rare. When you find a game made for the players it is a cool thing, and makes you happy to play and become involved. That magic is key, making you happy you became involved, and pulling you into the excitement of the hobby. How many games can do that? Again, we see design pulling together many elements to make a success story, from art, graphic design, playtesting, rules, mathematics, and many other fields to make a solid game. The design serves the play experience, and that experience is king. Arkham Horror gets it right in many ways.